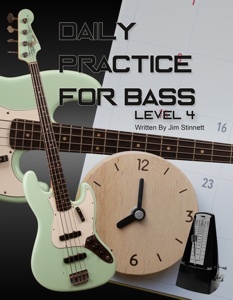 Daily Practice For Bass Level 4 is more of a good thing. Yes, players at all levels need to have a practice plan. In this book we will continue with our forty-five minutes of daily focused practice. We will add some new topics and of course delve even deeper into some areas from the previous books. I hope you are as excited about your potential as I am. I know that this path will lead to any level of playing to which you aspire.